Why does Congressman Emmer fail to support, and work to pass, the Muslim Brotherhood Terrorist Designation Act? Because Emmer and staff are lobbied by the Muslim Brotherhood front groups? 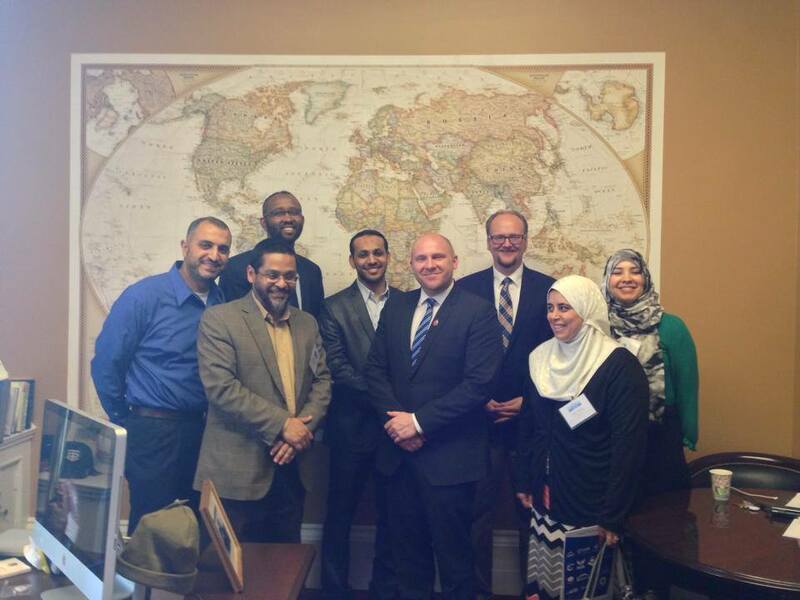 How often does Emmer and staff meet with CAIR, MAS and other MB front groups? This bill requires the Dept of State to report to specified Congressional Committees within 60 days indicating: (1) whether the Muslim Brotherhood meets the criteria for designation as a foreign terrorist organization; and (2) if not, which criteria have not been met. The U.S. desperately needs to pass this Act in designating the Muslim Brotherhood and front groups, such as Council on American-Islamic Relations (CAIR), Muslim American Society (MAS) and Muslim Student Association (MSA), as the terrorist organization that they are. The Muslim Brotherhood is conducting civilization jihad within the United States. THE MUSLIM BROTHERHOOD LOBBIES CONGRESS… WHAT EXACTLY IS GOING ON BEHIND CLOSED DOORS? April 2015 With Waleed Shady, Imam Asad Zaman, Abu Mahmoud, Jason Frye, David FitzSimmons and Eman Haymour at United States Capitol. April 2016. Muslim American Society is the Muslim Brotherhood. Back right is the regional director of CAIR, also Muslim Brotherhood... with Congressman Emmer's chief of staff. There is a reason Emmer doesn't support the Muslim Brotherhood Terrorist Designation Act. Washington, DC: It is no longer a question of whether the United States will designate the Muslim Brotherhood as a foreign terrorist organization. It is only a matter of when and how. Congressman Tom Emmer does NOT support President Trump’s effort to secure our southern border by building the border wall… Criticizing the President, Emmer stated that Trump was appealing to our “basest instincts” and Emmer does NOT support H.R.1813 - Border Wall Funding Act of 2017. Is Emmer working for you??? Or… The swamp? The truth is, both Democrats and establishment Republicans have turned Washington D.C. into a money-making machine for retaining their seats in Congress and maximizing personal gain. Raising money for Republicans to remain the majority in Congress is good... except, this is to keep establishment career politicians in power, the wrong Republicans. Congressmen are pressed into raising half a million to a million for the NRCC, in exchange for committee seats and power positions. Some call that extortion… but, Congress writes their own rules. Holding court as Deputy Chair of the NRCC, none other than CD-6 representative and former National Popular Vote Lobbyist, Congressman Tom Emmer. Given enormous time demands raising money and serving as “head coach” for the D.C. home team, the NRCC, is it any wonder CD-6 residents are frustrated with inaction on home town issues. Many hard hours working for a private organization in D.C.? Did you want your representative working for you full-time? No wonder constituents in the 6th District are frustrated! And, you thought Mr. Emmer was working for YOU! Congressman Emmer is working for a 'private' organization as Deputy Chair of the NRCC... Pay attention to the bill Congressman Massie holds up in the video below (approx. marker 5:55)... it has 'NRCC' right on it. The NRCC is the enforcement wing of the Swamp and our congressman is the head of the SWAMP PAY-TO-PLAY CABAL! Mr. Emmer works many hours for this bully of DC organization... This organization is fairly new. Gotta get rid of it. Congressman Emmer voted in favor of President Obama's unconstitutional Every Student Succeeds Act (ESSA). "I believe that the greatest advantage we can ever give the next generation is a good education. Unfortunately, the education system in this nation has its fair share of problems. While the strength of this nation is the diversity of its people, our diversity is not always reflected in our education system and too many children have fallen through the cracks as a result. That is why, last year, I voted in favor of the Every Student Succeeds Act (ESSA), which gives control over our education system back to the states and local communities. This important legislation allows parents – not the government – to determine what type of school best suits their child’s needs." "The DoE is giddy with excitement at the impending passage of ESSA"
If this legislation improved local control of education, why was the left so happy when it passed? Contrary to the Establishment talking points, ESSA increases Socialization and Federal Control of our education systems through implementation of Universal Pre-K and a completely new social services beast called Full Service Schools and maintaining Common Core Standards. Previous to ESSA the Federal government coerced states into Common Core with funding (Obama’s Race to the Top) and the waivers from No Child Left Behind (NCLB). Common Core was a leveraged buyout of our education curriculum–most states adopted Common Core. With ESSA our republican controlled congress allowed themselves to be duped by the promise of eliminating Common Core while failing to recognize that the education cabal had already inextricably enmeshed all aspects of education with the Common Core—textbooks, database and software corporations and ACT/SAT testing services. So I ask you, parents... do you feel more empowered now that the federal government has imposed ESSA and Common Core? "If I have a problem with something my son is learning in class, I can't go t the school district, I can't even go to the state anymore. It's out of our hands." Tom Emmer supports federal control of education. That’s money leaving the U.S./Minnesota to Somalia!!! "Apparently, suitcases of cash works!! National spending on resettlement in 2016 alone was $867 billion in welfare payments and $71 million on education support, mostly state and local governments. It’s estimated $1.4 billion in remittances are transferred to Somalia annually. Much of this money originating as taxpayer funded public assistance and some derived from fraudulent daycare scams, transferred in suitcases of cash. Effectively a government program confiscating US wealth (as taxes) redistributing to the third world. But much of the money is stolen by corrupt government officials or fundamentalist terrorists, Al Shabaab. Our Congressman is fully on board. February 2016, MPR reported a joint effort by Tom Emmer and DNC co-chair Keith Ellison facilitating Somali remittances, “Minnesota lawmakers have long sought a plan to allow money transfers to continue after banks in the U.S. stopped handling them.” –because the money could not be kept from corrupt Somali terrorist groups including Al-Shabaab. Is Congressman Emmer supportive of President Trump or fighting against him?? Our Congressman also joined forces with Sen. Amy Klobuchar to fight President Trump’s proposal to cut 31 percent from the $27.7 billion proposed for 2019. --payments going to 96% of countries worldwide. This in the face of a CBO projected $1 trillion-plus annual budget deficit. Please explain how the American Taxpayer is constitutionally responsible to financially support 96 percent of the rest of the world! Is the money we are borrowing from our children really making a difference? Digging the debt hole deeper and deeper... we are committing economic suicide with nothing to show for it!! Congressman Emmer was for the Omnibus Spending Bill before he was against it! Before you proudly pat Congressman Emmer on the back after his chest pounding... Understand, Emmer actually HELPED the Omnibus spending bill pass. How? Emmer voted to bring the bill to the House floor where he and leadership knew it would pass with the help of Democrats. Republican members of Congress, including Tom, voted to approve a rule that allows the House of Representatives to vote on a 2,232-page bill a mere 16 hours after its public release. Meaning... they voted to bring it to the House floor, without any time to read it but, once on the House floor they knew it would pass with the help of Democrats. Only a few more Republicans joining the 25 would have killed the bill in committee. Emmer did not join them. He was for it before he was against it—when it didn’t matter. This is exactly what Emmer did... he failed to 'vote against the rule allowing for consideration of the bill'... but, rather he helped bring it to the floor THEN he safely voted against the Omnibus bill... He knew he could safely vote against it on the floor, making his constituents happy yet, made congressional leadership happy by being a team player and bringing it to the floor where it would pass. The 25 Republicans simply needed a couple more Republicans to join them in voting 'NO' on the vote which brought it to the floor. Emmer wasn't one of them. Tom Emmer was a paid lobbyist and spokesman for the National Popular Vote (NPV). NPV is a movement largely funded by George Soros which circumvents the electoral college--a key to maintaining states rights. "We oppose the National Popular Vote Interstate Compact and any other scheme to abolish or distort the procedures of the Electoral College. An unconstitutional effort to impose National Popular Vote would be a grave threat to our federal system and a guarantee of corruption, as every ballot box in every state would offer a chance to steal the presidency. We urge state legislatures that have voted for this proposal to rescind their approval." So... Why would Tom Emmer work as a NPV lobbyist and Spokesman?